This piece was published in The Big Issue in January 2009. Anyone in search of of wild, spectacular Scotland – ruined castles and heather-strewn Munros – may find themselves a bit underwhelmed by the Barry huts. But there is something compelling about this ramshackle collection of wood, windows, tar roofs and chimneys on the north east coast. Even in bleakest January, as the wind batters in off the sea, the makeshift dwellings make demands on your curiosity, if nothing else. How did they come to be here? Who lives in them? Is it possible to get warm inside? Jim Rowling is happy to show me around. 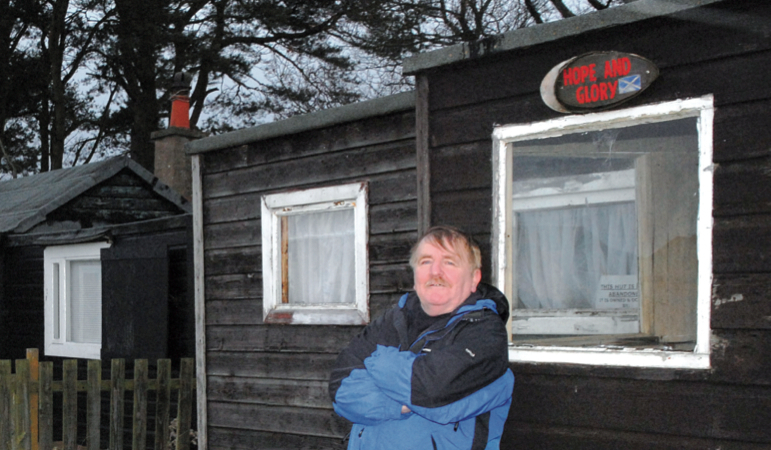 The Glasgow lorry driver and his wife Pauline, both in their late 50s, drive up to their holiday hut a few miles outside of Carnoustie as often as work allows. He may have spent the best part of a decade travelling across the globe with the armed forces (Kenya, Cyprus, Turkey) but Jim found his very own Shangri-La 60 miles up the A9. The huts have a remarkable history. Older incarnations of the 45 remaining dwellings were established at Barry in the early 1920s as getaways for soldiers returning from the trenches of the First World War. The blessing of benevolent lairds allowed amateur construction to take off in the 1930s. Barry was one of several sites to bloom across rural Scotland, as working-class families from towns and cities in the central belt sought fresh air and freedom in the country. To the horror of the current Barry hutters, mostly descendants of tradesmen from the west of Scotland, this distinguished legacy is under threat. The latest landowner, Shoreline Management Ltd, does not share the hut-owners’ notion of entitlement, and disputes over rent, access and upkeep have turned ugly. Site manager Andrew Young now deems the hutters squatters. He is adamant they have no right to be here. However, Jim and Pauline are determined to fight to save each and every hut. Over several cups of tea in the toasty front room (the little electric fire finally bringing sensation back to the extremities), Pauline paints a cheery picture of a typical summer at Barry: children horseriding on the beach; bingo games; fortune telling; mock cowboy hoe-downs. The excitement of watching test flares on the horizon and practising parachute troops falling slowly from the sky. The tranquil was interrupted nearly two years ago. The battle began when Shoreline Management almost doubled the annual rents in the spring of 2007 – from around £250 a year to £470, according to Jim Rowling. The hike was something the hutters were prepared to swallow but, after inspecting the site more thoroughly, the site owners decided the dwellings were health-and-safety headaches. “You wouldn’t let your dog live in them,” managerAndrew Young insists. “They’re rat-ridden, leaking, death traps. Imagine your 50-year-old garden shed botched up with a tar roof and a tin chimney. Shoreline Management, which owns a modern caravan park next to the patchwork domiciles, blocked access to the huts that same spring, closing the gates and digging a trench around part of the site. The hutters were undeterred. She and husband Bill, from Denny near Falkirk, want to continue to give their 10 grandchildren the chance to experience rural life. For Bill, it’s the charge of neglect that niggles most. The hospital porter has rebuilt and refined his hut from a shell, after coming out of the Army in 1974, and takes obvious pride at how sturdy it has become. “There’s no rats here, I can assure you,” he says as Silvia hoovers the floral carpet and dusts the crockery displayed on the cabinet shelves, finishing touches to a Scots sitting room in miniature. The huts remain a legal anachronism since they were set up long before modern planning regulations. In May 2007, the hutters claimed a temporary victory with a successful interdict to stop Shoreline Management from “demolishing, damaging or otherwise interfering” with the homes (so declared an Arbroath sheriff). The ruling galvanised the hutters into building a case for “tenancy at will”, a right obtained partly by historic longevity, which would have guaranteed protections to sit on the land. They lost at a civil court ruling late last year, however, and are now appealing the decision. The hutters have come to believe Shoreline Management want the huts demolished and replaced with caravans. Since repairs to the huts – asked for by the firm – have not been carried out, Shoreline do not recognise the occupiers’ status on the site and rents are not being charged. Scotland has a long history of land battles. This one has links to a dispute over the Carbeth huts, 10 miles outside of Glasgow, which caught the nation’s attention a decade ago when rent rises by the laird escalated into a full-blown fight for survival. Like the Barry hutters, the group at Carbeth wanted an end to year-to-year leases offering no protection or incentive to maintain their holiday homes. At the height of the dispute, after some of the huts were burned down, a committee at the Scottish Executive looked into the affair and concluded someone should investigate further. Although no legal boundaries were established for the peculiarity of the huts, the Carbethians managed to win the support of the local council in creating a conservation area and a not-for-profit company. Anyone lucky enough to visit the place cannot fail to be charmed. Tiny green and brown hobbit-like cottages nestle under rolling hills and forest, chimney smoke circling skyward. Tommy Kirkwood, one of the Carbeth story’s chief protagonists, walks me through the rustic settlement, stopping to say hello at folk working on their huts for the weekend. “This is an important part of Scotland’s history,” says the 63-year-old, whose family have had a presence at Carbeth for 50 years. The community, about 100 hutters strong, have gradually come to a much-improved understanding with the landowner Allan Barns-Graham, whose grandfather presided over the community’s creation. A deal over longer leases and rents agreeable to both parties is close to being struck. There is a less happy tale to be told further south. A small group from Dumfries were evicted from their holiday huts on the Solway coast after now-familiar rent hikes and a failed attempt to obtain tenancy. After losing thousands of pounds on the court case, they even had to demolish their huts plank by plank in 2007, terrified further costs would be imposed by the landowner if they didn’t clean up the beach. “It was not the easiest task to take the hut apart,” recalls Bill Allen, a 49-year-old who believes some of the oldest structures were built with driftwood and materials washed up from Clydeside shipyards. His own hut was made by his grandfather in 1936. Up in Barry, Jim Rowling is exploring his options. He admires the communal trust model of Carbeth and wants to establish the Barry Hutters Association as a registered charity. He is aware of how complex and precarious legal battles over land can be. Another difficulty lies in encouraging the other 40 or so hutting families to expend as much energy during the bad times as they did in the good old days. “Some of the huts are getting run down and if they’re not maintained it gives him [Andrew Young] ammunition,” concedes Jim. “Some people are too intimidated to come up here and are scared to invest in their huts, but we’re all still determined to fight for our rights in whatever way we can. Fighting for a bit of peace and quiet. Rural living for the urban working-class. Investing for future generations based on a cosy view of the past. Nothing about the huts is straightforward. If they are to survive, at Barry and elsewhere, Scotland will have to learn to embrace the anomaly.